• The First Annual Grand Luxxe Member Invitational will be played on May 27 – 29 at the El Nayar Golf Club, offering 1 million USD for the hole in one. 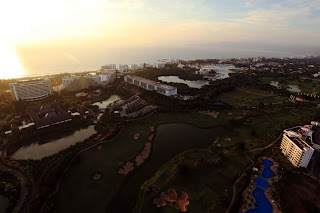 In Riviera Nayarit luxury means golf. The First Annual Grand Luxxe Invitational will take place on May 27 – 29, offering one of the most exclusive golf experiences: the Sierra Madre, a golf course designed by Jack Nicklaus, avant-garde cocktails and a 1 million dollar prize for the hole in one, and prizes for the 12 best O’Yes. This is luxury golfing! El Nayar golf course at the Grupo Vidanta complex in Nuevo Vallarta has invited members of Grand Luxxe, one of its most exclusive resorts, to participate in this tournament. Prizes include four luxurious watches for first place in each of the four Par-3 in the course, a complete set of Taylor Made clubs the second places in these holes, one Macbook Pro the third place in these holes, 4 iPad Mini for fourth places and 4 sets of Taylor Made fairway Woods for fifth places. “We’ll enjoy three days of exceptional golf reserved for our members, but who are also inviting the local golfing community to participate in the opportunity to win prizes that rarely occur in amateur tournaments in the region. We have availability for 56 couples only, because registration was initially open only to members of Grand Luxxe. It’s important that local golfers who want to participate register as soon as possible”, said Jesus Torres, golf director of Vidanta. The program includes activities such as Ball & Club fitting by Ping on Monday 27, just before the practice round, two rounds of competition on Tuesday 28 and Wednesday 29 respectively, followed by snacks at the beach on Tuesday, and the special competition for the 12 best O’Yes for a Million Dollar play on Wednesday. The award ceremony will include a buffet dinner at the beach. The Convention and Visitors Bureau (CVB) of Riviera Nayarit congratulates Grupo Vidanta for their continued leadership in the development of products that enable us to attract new tourists to the destination and for integrating the local community in these projects.